Gregory Mc Grew creates worlds, mental landscapes that resemble the dreams of an educated film-lover. 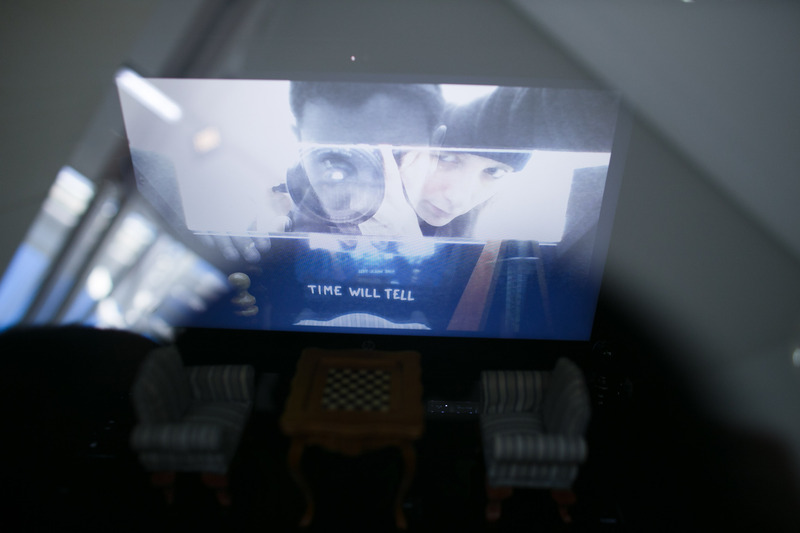 Through videos made of patiently altered images, and installations that mix virtual images with real chess pieces captured inside boxes, Gregory’s latest creation taunt the viewer to puzzle a meaning – unless he only wants to lead us behind the mirror, where logic is different and identities put to the test? 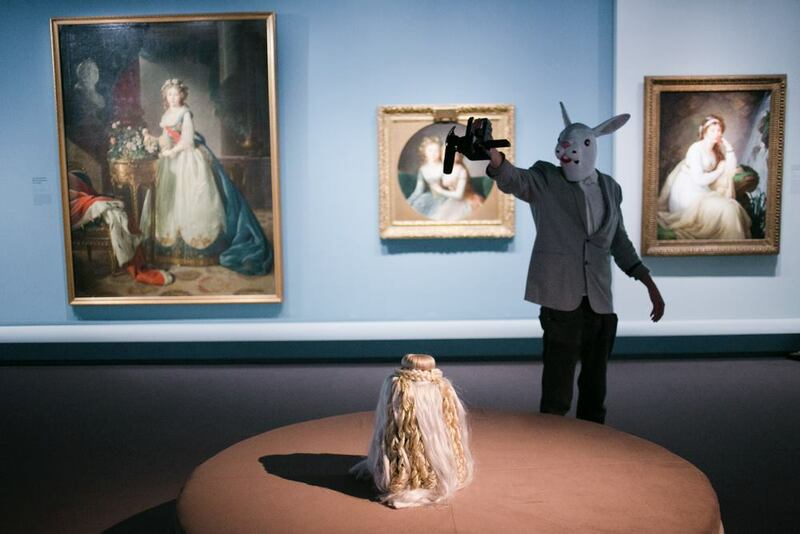 “Once a pawn a time” was initially presented during the Nuit Blanche 2015, as part of a series of events that saw the artists and other members of the Pezcorp collective turn the Grand Palais into a carnaval of parodic representations (Lose your Head In Selfie Land). 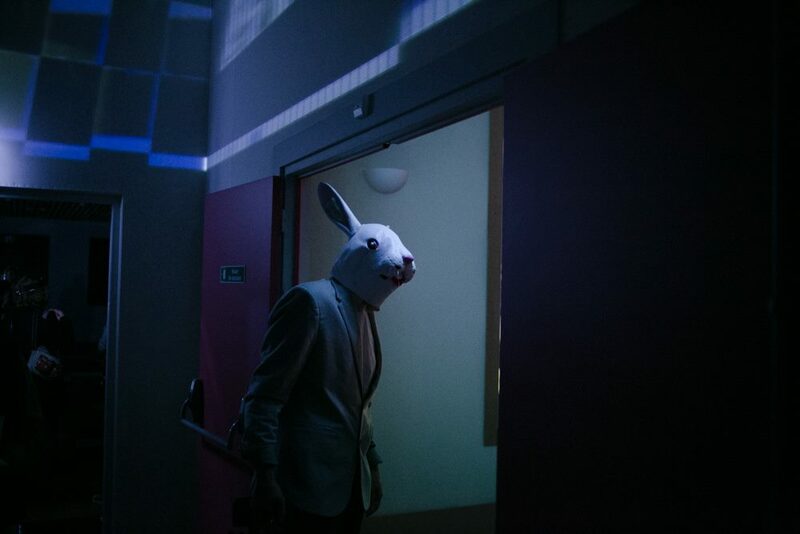 In a festive context that showed the artist wearing a rabbit’s mask under Vigée Le Brun’s royal portraits, the video interrogated contemporary narcissism and our desperate search for meaning in the manipulated mirrors of our cameras. The pawn, that piece of uncertain identity who has the ability to become a queen when it reaches the end of the board was here a political metaphor : the Revolution eventually cut the head of Vigée le Brun’s favorite model. In a reversal of Lewis Carol’s tale, the pawn decided the destiny of the Queen. Off with her head. And was it the rabbit who led the pawn to the queen? 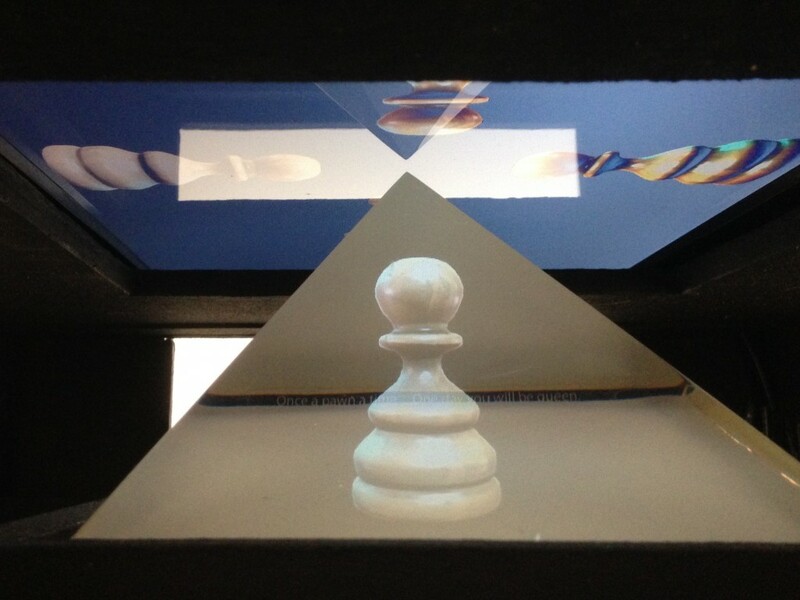 Inside the box : hologram, mirror images, and floating words : “once a pawn a time you will be queen”. 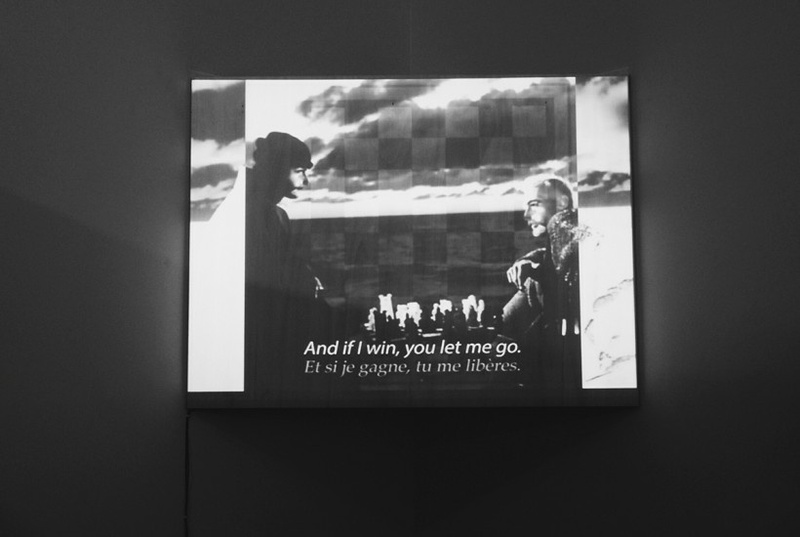 During the 66th edition of Jeune Création, hosted by galerie Ropac in Pantin, the video had lost these political meanings but regained the three black boxes presented separately at the Grand Palais. It remained however a tale about the rewriting of identities, about the mental construction of new possibilities. 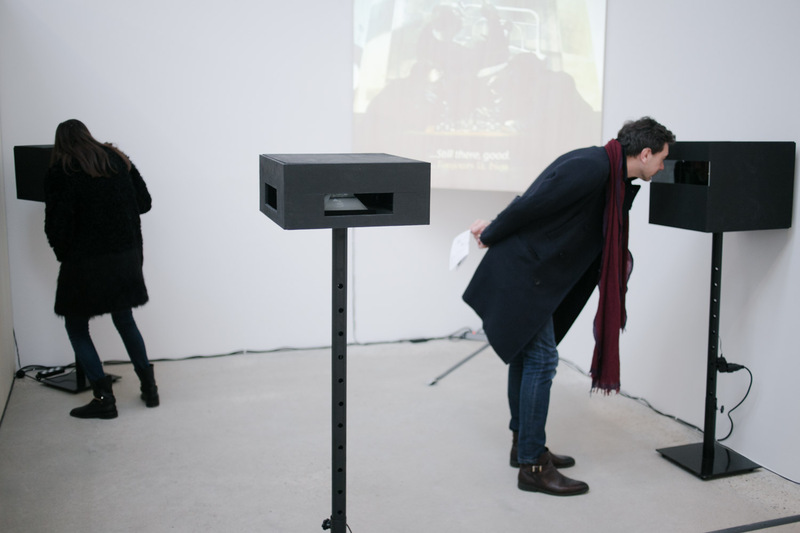 Installation at Gallery Ropac in Pantin, January 2016. Ph. Charlotte Gonzalez. Bringing together footage of classic movies by Tarkovsky, Bergman, or an adaptation of Zweig’s Schachnovelle, it introduces chess players as diverse as a young girl, death, or a sick chess master. On all their faces, the face of the artist has been discreetly superimposed. In the boxes, holograms of chess pieces take shape from a scintillating rain, cryptic phrases force you to lean closer to read them until your distorted reflection becomes part of the image, and chess pieces have just made their opening moves. Inside the box. Ph. Charlotte Gonzalez. Flashes of recognition, dramatic moments from the movies seem to beckon : this is about death and metaphysics, about life and death, about pushing the boundaries of human identity. But empathy is denied as soon as it is evoked – the room moves, the character shifts, the meanings vanish. Gregory Mc Grew’s face and checker superimposed on Bergman’s Seventh Seal. We reproduce this movement by walking around the black boxes, looking into the holes, finding our reflection when we hoped we would remain only voyeurs. There are more layers to Once A Pawn A time – like the allusions to the chess board pieces, hand-carved by Marcel Duchamp in 1917, and recently reprinted in 3D by artists, immediately raising threats of lawsuit and copyright infringement. Gregory Mc Grew’s creation has appropriated the powerful imaginary symbol of the game chess, telling us our virtual worlds are not merely there for entertainment. They will mess with our heads, and shape our possibilities. Follow me…. Gregory Mc Grew photographed by Charlotte Gonzalez. Thank you Gregory for guiding me in your world, and for letting me come out again with my head. This entry was posted in French artists and tagged Gregory McGrew, Jeune Création, Young French Artists by psac. Bookmark the permalink.